We've rewritten the README.md for Dynamite Valley. I've pasted it in below in the hope that PyWeek participants will see it and have a better time playing Dynamite Valley as a result. The beavers here in Dynamite Valley Park have been working overtime, making dams! If I've told you once, Ranger Jim, I've told you a thousand times--we need you to blast those consarned dams! 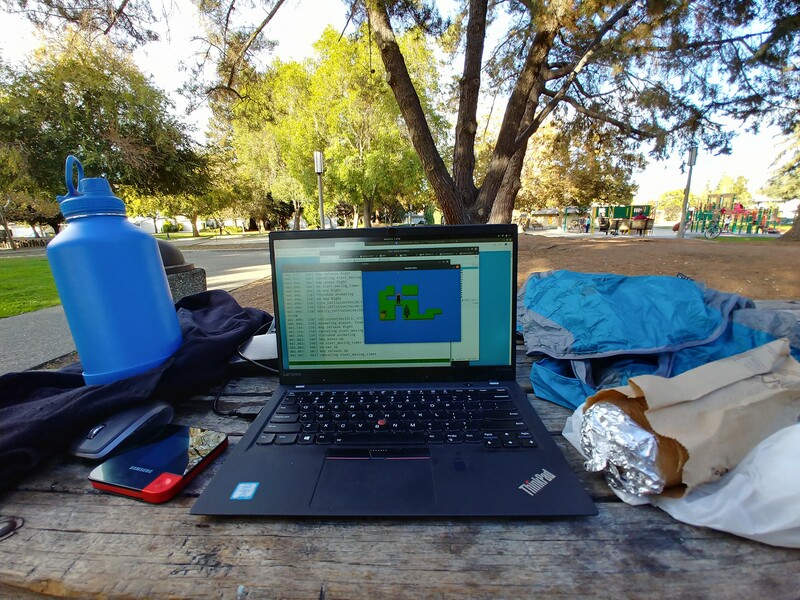 "Dynamite Valley" is an exciting action game written by Daniel Pope and Larry Hastings for the "PyWeek 26" programming competition in October 2018. This guide will explain to you everything you need to know to play Dynamite Valley. We sincerely hope you have fun playing! Now get out there and wipe out those dams! You play as Ranger Jim, a park ranger at Dynamite Valley Park. Your job: remove the dams infesting the park's beautiful waterways! With explosives! Every level has a number of "dams" floating in the water. Ranger Jim has to destroy all the dams to advance to the next level. If you complete all the levels, you win! Both Dan and I played through the final version of the game, version 1.0.2. Every level is winnable! We guarantee it! Note that on some levels you can put yourself into a situation where the level is no longer winnable. For example, on some levels you only have a limited supply of bombs, and if you misuse them the level may no longer be winnable. If you think that's happened, you should start the level over. Also, the first zip file release of "Dynamite Valley" had a game-breaking bug. We guarantee that version *isn't* winnable! 1.0.1 had a minor bug that could be worked around. 1.0.2 and anything newer should work great! Dynamite Valley requires Python 3.6 or higher. Check the requirements.txt for what you'll need. Dynamite Valley needs both PyGame and Pyglet. We recommend running Dynamite Valley with "python3 -O". Pyglet's Open GL support occasionally, if rarely, throws assertion failures. If you use the provided launcher `run_game.py` we do this for you. T - Start the tutorial (recommended!). Space - Play the game starting at the last level you played. In the game, you control Ranger Jim, a park ranger working in "Dynamite Valley". Ranger Jim can pick up up to two bombs at a time. When he drops a bomb, he drops the bottom bomb from the stack. That's always the most recent bomb he picked up. Dynamite Valley doesn't support joysticks or the mouse. Ranger Jim does his work with bombs. As we all know, bombs "detonate", turning them into explosions which "blast" nearby objects. Specifically, exploding bombs in Dynamite Valley "blast" their four nearest neighbors (up/down/left/right). Bombs on land can still blast objects floating in the water, and bombs in the water can still blast objects on land. Bombs that Ranger Jim drops are automatically armed. Ranger Jim can't pick up a bomb that's been armed. Timed Bombs are the most frequently-seen type of bomb. They look like the classic movie bomb: a black circle with a small black cylinder near the top, and a fuse. They detonate 5 seconds after being dropped. When "blasted", Timed Bombs are "flung" one space away. Contact Bombs look like black spheres with little round nubs poking out in all directions. They're very sensitive! Contact Bombs automatically detonate when they're pushed into something, or when they're blasted by another bomb. Remote Control Bombs look like Timed Bombs but with a red ring around the small cylinder at the top. You detonate an RC Bomb with the "T"rigger key. RC Bombs detonate one at a time, in the order you dropped them--if you drop five bombs, you have to press "T" five times to trigger them all. Remote Control Bombs that are blasted are "flung" like Timed Bombs. Frozen Timed Bombs and Frozen Freeze Bombs pause their countdown for 5 seconds. Frozen Contact Bombs are desensitized to impacts for 5 seconds. Freezing doesn't affect Remote Control bombs. There are a lot of decorative objects that are immune to blasting and freezing: trees, rocks, and--strangely enough--beavers and bullrushes. However, you can destroy bushes by blasting them. If Ranger Jim gets blasted or frozen, the level is over and you have to restart. Most water is still water. However, some water is flowing in a particular direction. You can tell what water is flowing water by paying attention to the ripples in the water: when the ripples are moving, that shows you what direction that patch of water is flowing in. Flowing water will push objects along, like floating logs or bombs dropped into water. Objects in flowing water move at the rate of one screen tile per second. Objects in flowing water that get pushed up against something get stuck. (Unless the object is a Contact Bomb--in which case, it explodes!) Once the obstacle is removed the object will resume floating along. Ranger Jim can step on most floating objects. There are only a few he can't, like beavers and bullrushes. If Ranger Jim steps on a floating object that's in flowing water, he can ride on top! Ranger Jim can't pick up any object that's floating in water. If Ranger Jim falls in the water, the level is over and you have to restart. But don't worry, Ranger Jim won't walk into water--he stops at the shore automatically. Objects can occasionally move very quickly. This is called being "flung". Timed Bombs that get "detonated" are flung one square away from the explosion. When Ranger Jim drops a bomb on top of a floating object, the bomb is "flung" over the object, heading away from Ranger Jim. If there is a series of floating objects all in a row, the bomb will "skip" along all of them until it lands in open water... or on a distant shore! You can make your own Dynamite Valley levels! First, open up the "src/levels" directory. Dynamite Valley levels are individual text files in this directory. The easiest way to make a new level is to copy an existing level, then edit it however you like. Edit the level in your favorite text editor, then save your new text file in "src/levels" with the ".txt" file extension. You can play your own levels with "run_game.py <name of level>". For example, if you name your level "fred.txt", you can play it with "run_game.py fred". Here's a quick description of the level format. Levels are text files, using simple ASCII files. Each level text file has three sections: the "tile map", followed by the "legend", and finally the "metadata". The first section is the "tile map" for the level. This must be exactly be 12 characters across and 13 characters tall. The "tile map" is a sort of ASCII art drawing of the level, where one character maps to one tile on the screen. After the "tile map" there should be one or more blank lines, and after those blank lines should be the "legend". The "legend" establishes what the characters of the tile map represent. A "legend" line is a single character, followed by a space, followed by a definition of what that character represents in the "tile map". There's also a default "legend.txt" shared by all levels containing all the most commonly-used tiles. After the "legend" there should be one or more blank lines, followed by the "metadata". The "metadata" establishes various other facts about the level. The format of a "metadata" line is: a noun with a colon at either end, followed by one or more spaces, followed by the value for that metadata. :title: The name of the level, displayed at the loading screen. :hint: The "hint" for the level, displayed at the loading screen. :author: The "author" for the level, displayed at the loading screen. :next: The name of the next level. When the player finishes this level, the game will automatically switch to this level. The only required metadata is "next". All the others are optional and have sensible default values. Giant Bombs, which blast all squares within a "Manhattan distance" of 2. Moving beavers, which would swim back and forth in a predictable pattern. Swimming beavers would push any floating object (including a Contact Bomb, which it would not set off). Blasting a beaver would be an automatic level failure--you can't hurt the wildlife, you're a park ranger! Aargh, game breaking bugs introduced at the last minute! As is customary I've uploaded a 1.0.1 with bugfixes for game-breaking issues only. I've played end-to-end now and the game is completeable. As always it was a race to the finish line, and the level design was mainly left until last. We have a great engine, but only 11(?) full levels. I think there are some real challenges in there, though, so hopefully it's a good amount of content. If you can decode the level text-file format you can try creating your own levels. I'm very happy with the game, on the whole. It is cute and colourful and challenging and satisfying. I hope you enjoy it!